I felt that I received a lot of one-on-one attention in my classes at Mount Union but particularly in science. Professors invested a lot of time in students and figuring out how to help them achieve their goals. Currently, I’m in my fellowship training for pediatric oncology in my first year of a three-year fellowship. I’m completing clinical work now and will spend two years doing research after this phase. I will then move on to an attending/scientist position. My ultimate goal is to have a research lab focusing on pediatric cancers. I wasn’t sure exactly what I wanted to do in high school, and Mount Union offered a nice liberal arts education and background so I could study chemistry and also take other classes that made me more well-rounded. Professor Laura Beal, who was my chemistry professor at Mount Union, took the role of my mentor. She encouraged me to go into research and investigate whether I was interested in scientific research for my career. While I was at Mount Union, one of my professors recommended a summer research program at Wellesley College in Boston, which made me realize I enjoyed doing research. I decided to pursue a Doctor of Philosophy degree in chemistry at the University of Michigan to explore my research interests. While there, I met a lot of people who had both M.D. and Ph.D degrees, and they encouraged me to consider medical school as a way to merge my love of research with the care of patients. After I finished my Doctor of Philosophy degree, I then attended medical school at the University of Michigan. I graduated in 2011 and completed my residency in pediatrics. 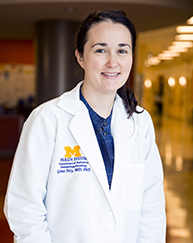 I am now working to complete my pediatric oncology fellowship at the University of Michigan. While at Mount Union, I was a member of the American Chemical Society and the Alembroic Society, an organization for chemistry students. I was also a chemistry tutor and a member of Alpha Delta Pi sorority. It’s important for students to have good mentors and people who think about things they’re interested in and support you through figuring it out. My professors at Mount Union definitely did that for me. I want to know that I did something positive for someone else. The care of pediatric oncology patients has improved by leaps and bounds over the last 30 years. If my patients that are dying today are not going to die in 30 years due to my research, then I will know I was doing something worthwhile.